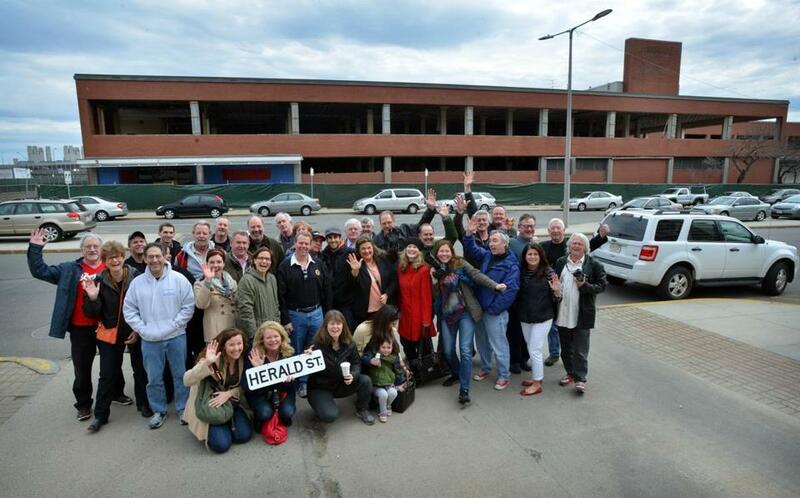 Current and former employees gathered Sunday outside the old Boston Herald building. That was the message from about 30 former Herald staffers who met across the street from the building on Sunday afternoon to reminisce before demolition begins on Friday to make way for an apartment and retail development called the Ink Block . Peter Gelzinis, a Herald columnist who first joined the newspaper in 1972, said many of the personalities had a deep knowledge of Boston’s history, and a certain flair. He recalled that Kenny Mayer, a Herald columnist and radio host who died in 1982, was always tanned and preferred velour shirts, gold chains, and mink coats. He also helped Gelzinis score interviews with top celebrities, including Frank Sinatra. Editors could be demanding. Michael Lasalandra, a former Herald medical reporter, spent several days in California in 1983 covering a highly publicized heart transplant for a Saugus man named John Faragi Jr., who died in 1998. Lasalandra said the editors would not let him return to Boston until he had a photo of Faragi in recovery in his hospital room, despite the reporter’s protestations that the room was closed to the press. He said he eventually persuaded Faragi’s mother to take a photo with a Polaroid camera that he gave her, and the picture ran on the front page. “There was always stuff like that,” Lasalandra said. A formal farewell is planned for Thursday, when speakers, including Herald columnist Joe Fitzgerald, will pay tribute to the site, said Ted Tye, a managing partner at National Development, the company building the Ink Block.